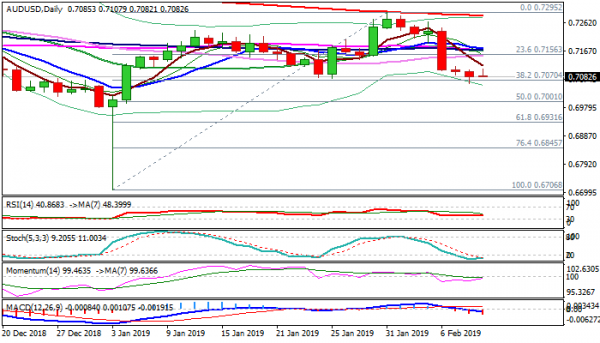 The Aussie holds within tight range and directionless mode, just above pivotal support at 0.7070 (Fibo 38.2% of 0.6706/0.7295 rally) which was cracked on Friday. Slight bid tone in early Monday is marked by rising momentum and stochastic turning north in oversold zone, as well as on comments of Trump / Xi meeting next month, which maintains slight optimism. With no signs of recovery, the downside remains vulnerable and risks firm break below 0.7070 pivot that would open daily cloud top at 0.7050 and psychological 0.70 support (also 50% retracement and near daily cloud base) in extension. Falling 5SMA marks initial resistance at 0.7120, however, lift above a cluster of daily MA’s (0.7150/74) is needed to signal reversal.